I love the first snow, you know the one I’m talking about the first REAL snow of the year the one that’s really gonna leave it’s mark. Not that piddly little quarter of an inch that was melted 20 minutes after it landed, the first big snow that’s dropping several inches of the white stuff. Well we’re having our “first snow” of the year right now. It’s been snowing since about 2:30 PM CST and now 3 hours later we have about 3.5 inches of it. The roads are totally covered, the snow plows haven’t been out yet, people are trying to shovel the walkways but it is just snowing. I always like the first snow, I don’t know what it is….I think it’s the calming of it. Walk outside after the first snow or while it’s snowing and it’s just quiet. The snow is muffling everything, the car horns, the stereos, the kids walking down the street, everything is just quiet, well to a point. I remember growing up in rural PA and when it snowed it was so quiet you could hear the snow landing. Have you ever heard that? It’s the most amazing thing, here you are in a vast open space, snow is falling everywhere and it’s loud! You can almost hear each snowflake land on the one before it and start to build that big layer that you’re going to end up shoveling in a few hours. At first you don’t realize it, you try and figure out what it is, you’re taking in the beauty that is just the snow and then it hits you it’s the snow. It’s the snow that is making all of that noise. Something light and fluffy and appears to be so delicate and fragile is loud. So loud that it makes you wonder what quiet really is? Like after you’ve been to a concert and you are lying in bed that evening and your ears are ringing, it’s that quiet but with snow! 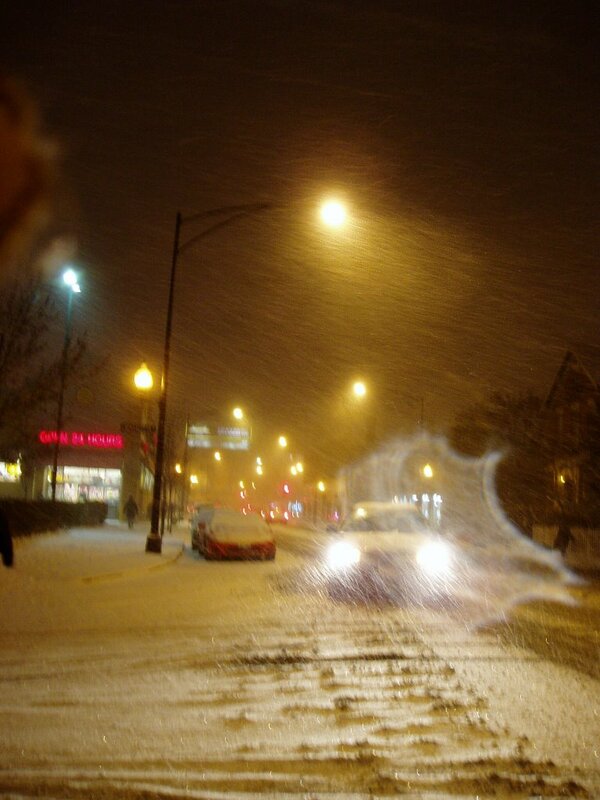 I love the city when it snows. Well when you get that first snow, because as soon as the snow plows and salt trucks are out and the snow is black, it sort of ruins it. But when it’s just starting, like it is now, that’s when I like it the best. The only people out are the ones that REALLY need to be out, that’s my favorite time to go walking, because it’s just you and the snow, and you’d better wear boots that’s for sure. I hope that we have a gentle winter as I don’t think I’m up for a lot since I lost my parking space last month! Now I’ve got to worry about winter in Chicago and I’m sure you’ve heard how crazy it gets here with parking spots. Oh don’t worry, I’ll post all about them this winter, I promise. I hope you get your first snow of the year soon (If you’re in the Northern Hemisphere and above the Equator). Do you know how long it took me to get to work today?!?! I hate Snow in WINTER! That piddly few inches that melts within half a day? That's about all we ever get. About once every three or four years we get more. Come to think of it, we are due for a good snow. CS - You've ruined my idea of Switzerland... : -( You mean it's NOT like that? I'm glad that you know what I'm talking about though. What a wonderful hommage to the emotions of the first snow. I love the first snow as well. Not much of it in Recife, though. Here people feel cold when the sun goes down!